What Happened to the Teacher and the Gift? I have received over 30 emails today asking if I ever found the teacher and gave her the gifts. I just love that ya'll care! I wrote the devotion over a week ago and I totally forgot that I didn't tell you where the gifts are. They are still sitting in my house...BUT I am still determined to hand them to her. She was the most amazing teacher and even today I thought of her. It's the last day of the first week of school and it's been Andrew's best first week ever. She helped him overcome so much anxiety and fear. She is also a Christian so she prayed for him and loved him into knowing he had a special role to play in that classroom. It was life-changing for him. She moved that day we missed each other, but her wedding isn't until September and she moved to a town near the same city where my sister-in-law lives. So I am still scheming to personally deliver them to her next time we are there visiting. Who knows it may be Thanksgiving or Christmas! Maybe I need to pray and make sure God doesn't want me to just mail them. Maybe I just need to write a really special letter and trust God with the personal delivery :-). What do you think? I walked along the winding road under a canopy of oak trees that lined the beautiful campus of Meredith College. It was my last semester of my senior year. I was experiencing a break in the clouds of depression that had overshadowed the past few years of my life. As I walked by each building or landmark of memories I thought about the people in my life that each place reminded me of. I thought about the day my mom told me she wanted me to go to Meredith. It wasn't a college we could afford. It would require many loans, scholarships and grants. My stepfather had told her that I would never go to there which made her even more determined. Her dream had been fulfilled. Her daughter was about to graduate from Meredith. I thought about my boyfriend who I had dated all through high school and college. The summer of my junior year our dreams and plans of a future together crumbled under the pressure of me expecting him to be all that I needed, and him wanting his freedom to do what he wanted. I looking at about the buildings and thought about the people inside. Professors, advisers and counselors who had tried to help me find my way. The pressure to study so I'd graduate with honors. I wanted so desperately to be thought of as someone with value. Someone worthy of mention. Yet the hurricane of my emotions had made it so hard for me to navigate through these unchartered waters. I had recently given my heart to Christ and that day as I walked, I remember asking this question: Why was all of this never enough? I don't know if I directed the question to myself or to God, but in the quietness of my heart I know He answered, because a thought I had never had came rushing through my soul. "Renee, all you have ever wanted, all you have ever looked for is unconditional love." "Yes, unconditional. Love you don't have to earn. Love you never have to fear losing. Love that isn't based on what you do or measured by what others are willing to do for you. "There is such a thing?" "Yes Renee, and you've been looking for that kind of love in everything you have done for the past 10 years - trying to earn your parents approval, trying to live up to their expectations, trying to convince someone to love you, not to leave you, trying to prove your worth and value to your professors and trying to fit in with your friends at all costs. Renee, you will never find that kind of love in anyone or anything but ME. I AM the unconditional Love you have been looking for." Two words I had never strung together became the answer to my life's question. I had been desperately looking for the lover of my soul. The desire of my heart. The fulfillment of my every longing. And all that time He had been listening, watching, standing at the door of my heart gently knocking, waiting for me to open my my soul to Him. That day I found what I was looking for. I found HIM! If you are here today from my devotion featured at Proverbs 31 Ministries or Crosswalk.com, WELCOME and thanks for stopping by! No matter where you are, whether or not you have responded to His knock, I'd love to hear your heart and pray for you this weekend. Do you have a story of looking for love, or being "looked for" by Love? Also, I am doing a give-away this weekend for 2 copies of my CD entitled "Searching for Satisfaction." To be part of the drawing, or to share your story, just leave your name and email by clicking on the word "comments" below and type in the white box. Then choose anonymous or your blog account. Please include your email so I can notify you if you win. I'll announce the winner Monday morning. Have a great long weekend. And remember today - you are loved! Our Dossier is On It's Way! 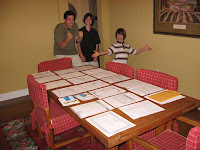 Just days before we left for vacation, we completed our dossier for the adoption of our little girl(s) in Ethiopia. Just in case you didn't know, we are in the process of adopting a daughter or two between the ages of 4- 10 from Africa. It's been almost a year since JJ and I felt God calling us to take the first steps. We did a lot of research last fall and then completed our home study in January/February. We got our I-600A approval in the Spring and have been working on our dossier for the past several months. There is so much paperwork! Look at all those stacks, with multiple papers in each pile. 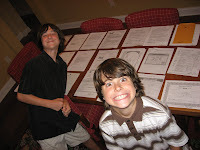 The boys are so excited that we are finally done with the paperwork and actually making progress. It's been a long wait for them. They keep asking "WHEN" are we really going to adopt? Part of our delay was that we put our house on the market, sold it in four weeks and moved in May, but the reason we moved was to make room for our new family so it was worth the wait. 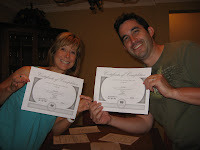 Okay, can you see the excitement in their eyes as we prepared for the auditing of this paperwork?! We double checked our stacks, made sure we had everything on the official list, had the boys bring us each piece as we read it out to them and then put the dossier in one envelope. 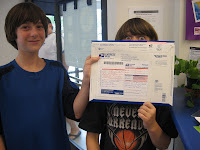 The next day the boys and I went to the post office to mail everything. We also needed to send our power of attorney paperwork to the secretaries of state in NC and in Washington state where our adoption agency is located. I was a little paranoid so I double checked AGAIN to make sure I had the right papers in the right envelopes going to the right addresses with the right return envelopes so they could send them back to the right people - us or our agency. Here the boys are ready to send "the package"! It felt like that envelope was holding a million dollars. What an amazing day - what an amazing accomplishment. Now it's all in HIS hands!! We found out this week that it's been sent to Washington, DC for approval, then it will go to our agency and they will send it to Ethiopia to be interpreted and submitted to the courts. It usually takes 4-9 months from this point (I think). With our dossier completed, we can now view DVDs that have footage and some interviews of children in the orphanages who are waiting for families. As we watch them, we pray and trust that God is going to show us just who she is - just who this little girl or girls will be that He wants us to bring home. We got back from the beach last Wednesday night. From that point on it's been a mad dash to the first day of school and the first day back to the office yesterday. I am sorry I'm not so good at blogging in the midst of a crazy busy schedule. For the next few days I thought I'd roll back the cameras and catch up on life here at the Swopes. Last Thursday was Open House at the middle school for Joshua where we got to meet his teachers and find out what friends are in his classes. Then we ran to Target for our final school shopping spree. While we were there some pretty girls started following my 13yr old son around, saying his name and then hiding behind shelves and clothes. They were 10! I am not ready for this! I thought I was going to lose it when they showed up in the underwear and socks area where we he was selecting his first pair of "boxers." I'm not ready for that either. I thought men wore boxers. My first born son is now a man-cub. 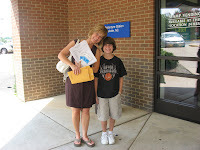 Friday was Andrew''s Open House at the elementary school where we got to meet his teacher- who I love. Guess what? One of the girls from Target is in Andrew's class! That pretty girl who was stalking my 13 yr old totally blew off my 5th grader, rolled her eyes at him and flipped her hair as she spun around to walk away, right as I was introducing myself to her mom. I was oh so tempted to say something but I kept my mouth shut. Good thing I'm reading "Taming the Tongue." It surely came in handy that day. Friday afternoon the boys invited four friends over to our house for an end-of-summer sleepover. It was so much fun! We had a house full with 2 parents and 6 boys! They ate pizza, ice cream, chips and brownies until they could eat no more. 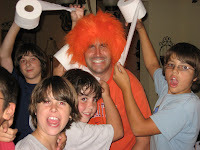 We played capture the flag, hide-n-go seek, a family game called ghost and then we did the unthinkable! The boys wanted to do something crazy and fun before going to bed. 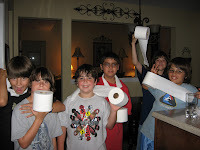 So we gave them each a roll of toilet paper and loaded them into our van. This was not pre-meditated, I promise! JJ drove them over to a friends house and let them "roll" Clint's car at 10pm. He's actually the dad of two of the boys that were here, and he's a youth pastor, so we knew he'd be cool with it. JJ took our camera and video taped the whole thing. Oh, and he wore his VT Hokie wig for added flare. When they got back we watched the video. The boys loved seeing themselves in the pitch of night with a camera spotlight and white rolls of paper sneaking around. Saturday morning I woke up feeling bad about the mess Clint would have to clean up so I drove over at 7am to help him. His car was already gone and their trash can was full of toilet paper. There were a few straggling strips laying on the ground so I picked them up and my prankster's remorse was relieved. Later that morning when he came to get his boys the kids showed him the DVD. They loved seeing his reaction and smile. He had no idea it was them. The rest of our weekend was filled with a birthday party, a date night, school paperwork, menu planning, more time with friends, church, youth group, and two very pooped parents! UPDATE (Tues 8/19) - We're still on vacation, 2nd time around. We're at the beach and we're having a great time. So relaxing! I had planned to blog about our trip, and show you what we did each day, but I forgot my camera cord for downloads so I'll recap when we get home later in the week. Be back soon! Thurs 8/14 - We've been on vacation! I ran out of time to blog the big news before we left and we had limited internet so now I get to tell you all about it with a few photos. 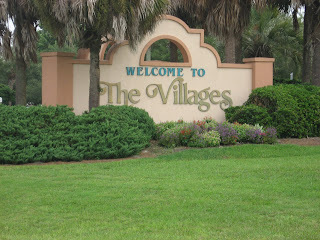 Last Saturday we drove eight hours south to central Florida to see JJ's parents who live in "The Villages" in Lady Lake. 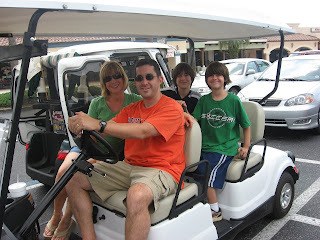 It's beautiful, relaxing and there are tons of fun things to do! We were "village people" for a few days and it was quite the life of leisure! 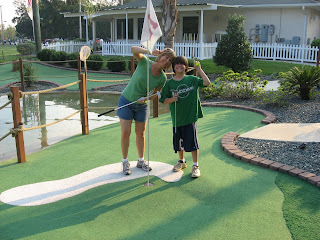 We played miniature golf while JJ took Joshua to the driving range for his first time. Andrew and I got a hole in one! That's us posing on the green. 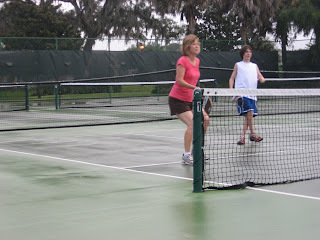 Grandpa also taught us all how to play pickle ball ( a combo of tennis, whiffle ball and table tennis) in the rain! Grandma set up Dominoes on the dining room table so we could play it whenever we wanted to. 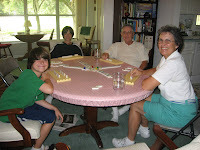 Our favorite game is Mexican Train and Josh proved to be the champion by winning every time! Village people live in a golf-cart community so we drove golf carts everywhere. JJ's parents even rented a four-seater just for us. It's one of the boys favorite things about where grandma and grandpa live. 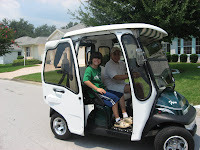 This is Grandpa Swope's newest pride and joy, and it's electric! On Sunday JJ and I slept late, went for a morning run, and then went to church at noon with everyone. 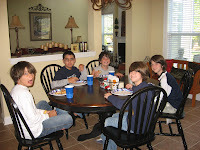 We all ate lunch out and then we went home. After which, I read a book ALL DAY! I had checked out James Patterson's newest novel "Sundays at Tiffany's" from the library last week. It's a sweet love story and I read the whole thing in a day. Now that has never happened before, but I'm hoping it can become my new pastime :-). 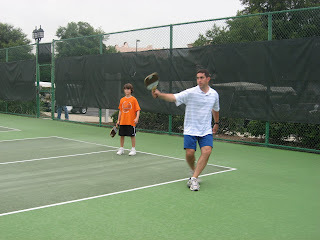 JJ played table tennis with his dad on Monday and then we all went out for lunch and ice cream. 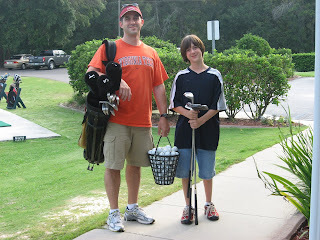 They played golf with his dad friends on Tuesday while the boys played bocchi ball and bocchi golf with grandma and I took a nap after watching two episodes of "What Not to Wear" - another something I never get to do. What a treat! 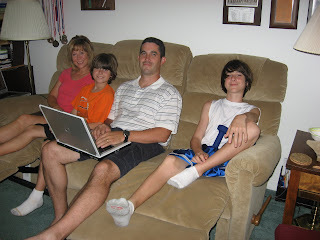 Every night we gathered in the family/tv room to watch the Olympics for hours and then went to bed oh so late! We left the Villages yesterday and drove home all day. Let me tell ya, it was hard to leave! The livin' is easy down there. Well, one of us got to enjoy it a little longer. Joshua is still there for a few days all by himself ( a first for him), with his grandparents. They are driving him back home on Saturday. We're not really ready yet for real life with the stress and strains of having a schedule, homework and projects for all of us at work and school, so we've decided to take a spontaneous beach trip this weekend just the four of us. It will be our last summer vacation as a foursome since we plan to add more kiddos by next summer! We're going to meet Joshua and the grands halfway between here and there (in SC) and stay through next Weds on Hilton Head Island. I can't wait to stretch summer out just a little more before school and speaking season starts in just a little over a week. I'm going to wiggle my toes in the sand, listen to the ocean breeze and maybe lose myself in another book! I'll keep you posted. I hope you are enjoying your last days of summer - stretchin' them out as long as you can!!! Crazy...that's how my kids will remember me! I had been trying to connect with Andrew's teacher to give her a thank you gift and a wedding gift since the last day of school. I went by her classroom two times during work days the week after school, and just missed her. We'd played email tag a few times this summer and again we kept missing each other. In the meantime, I've had these two beautiful boxes wrapped in foiled blue and brown wedding paper with swirls and iridescent bows sitting in my van. I saw them every day. They would ride with me everywhere. Sometimes I'd see them in the foyer, other times on the counter in the laundry room, when JJ brought them in. Every time I saw them, I put them back in the van and thought, "I' ve got to get these gifts to Ms. Currin." I was getting desperate! Her wedding is next month. I knew she'd be moving back to her home town. So, last weekend I decided I WAS GOING TO FIND HER. After more phone and email tag we made plans for me to go by her apartment Sunday, her last day here, while they were loading the moving truck. She gave me directions to her apartment building and said to call her when we got there so she could meet us at the car. I was so happy to finally be delivering "the packages." 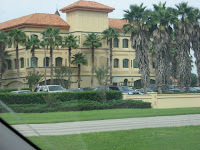 However, when we drove up to her building I realized I had not written her phone number on my little sticky note. I couldn't call her. I didn't have her apartment number either, because I was just going to call her. I had no idea what door to go to and no moving van was in site. We parked in front of a double sided, three story building with four apartments on each floor. I counted in my head - 24 doors to choose from! So, what's a desperate gift-giver to do? Get your husband, your two sons and their friend (10, 10 and 13) to get out in the 100 degree heat and go door-to-door in search of the teacher while you drive the air conditioned van back and forth in case she comes out of a different building. Well, the guys couldn't find her! So, I got out and started knocking myself. Still no luck. Should we just give up and go home with "the packages"? Nooo!!! I decided we should search the parking lot for cars that looked looked like they could be hers - ie. had contents resembling the belongings of a 4th grade teacher who is getting married. I just knew we'd found hers when we passed an old paneled station wagon full of "moving-out stuff." Although it was totally not a cool car and she is a cool teacher. Now, I don't know why I thought this super sleuth plan would help us. What was I going to do - write her license plate down and call the police to get her address? Eventually, I admitted my plan was a bust and we went home, where I found her number on my caller id. We finally connected. She said they'd gone to get lunch and she didn't have my cell number. I have never had so much trouble giving something to someone! The next day I was in the car with my boys when they started telling me how crazy I am and how embarrassed they were that I would make them go knocking on people's doors - with their friend. They told me that at one point he said, "I'm not doing this. I'm goin' back to the car." Now this friend comes from a classy family. They live on a golf course and I am sure his parents would never do something like that! I could only imagine the story he'd told his parents when he got home. My boys wouldn't let up! They described each scene with details of me peeking into cars and acting like a hillbilly! "Mom, you were actually looking into peoples cars and describing what you saw - that is weird mom!" Suddenly I could "see" how crazy we looked. But at the time it all made sense - I needed to find her! I was desperate and determined to get those gifts out of my car. As they re-told the story I laughed so hard I cried. Truly it was probably one of the funniest and craziest things I have ever made my kids do, but I am sure it won't be the last! I told them it'd give them something fun to remember about their crazy mom. Bless their hearts! I have had a couple of hard days. My heart has been very heavy since yesterday afternoon when I got an email from LeAnn saying that our precious friend, Anne Belk, had crossed the threshold of Heaven to be with Jesus on Saturday. I went to Anne's funeral with a few P31 friends this afternoon. It was beautiful - but it was hard!!!!! My heart is breaking for her 13yr old daugher, her 15 yr old son and her adoring husband, Carl. During the funeral, a close friend of her's read several entries from her personal journal and from her CaringBridge blog. What I'll remember most was how Anne described her times with Jesus and how she thanked Him for her precious husband- such a picture of God's unfailing love as he sheltered and cared for her each day during the past year. Anne chose to love. She pointed to God in every waking moment. Anne touched the lives of everyone God placed within her sphere of influence. 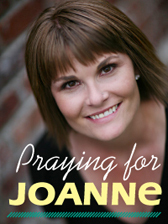 Throughout her life, and even through her battle with cancer, she reflected God's grace. She radiated a heart of worship and adoration for Jesus and praised His name - no matter what! In the midst of physical pain, Anne wrote a beautiful Psalm. It was on the funeral program so that we could remember the legacy of Anne R. Belk, a woman who was "joyful always, prayed without ceasing and gave thanks in all things." "Hallelujah! Praise Yahweh! Praise God! Though I walk through darkness, my Lord lights my path. Though fear and worry surround me, my Lord shows me the way. Though sickness has not left me my Lord holds my hand. Though doubt creeps in my mind, my Lord lifts me and carries me. He is my strength when I am weak. He never leaves me. His love surrounds me. I praise His Holy Name. To focus on my Lord, I receive the peace He offers me. I praise His Holy Name." The funeral ended with "Remember Me"- a song Anne had chosen by Mark Schultz. This is how I remember you Anne. As I end this day, you challenge me to live and love well, and to ask, "How will they remember me?" Will I choose to love? Will I point to Him enough to make a mark on things? I want to be an offering. As a child of mercy and grace, like Anne, I want to bless His name unapologetically and leave that kind of legacy! I have been so encouraged by all of the answered prayers over the past week. I've gotten some emails and read many responses left in the comments on my Power of a Praying Friend post. It's been such a sweet thing to read the prayers and the praises. I thought it would be fun throughout this weekend to each take time to give an update on what has happened in our lives that ties in with our prayer request. My praise is that I got ALL of my radio shows written on time last week, and my recording of them went so well this week. We also just got back from the bank and finalized all of our dossier and got a gazillion documents notarized and we mail it TOMORROW! It has been such a long process but I have to tell you that your prayers and the accountability of asking for prayers has helped us stay focused on being faithful to get it done. WOW - we are so excited and so relieved to have it all done. Okay, so now it's your turn. Please share what is going on with you!